Pest invasion has been a disruptive phenomenon in nature, the consequence being ecological and economical negative effect in natural ecosystem of the area. In agriculture, introduced insect pest has a devastating effect on food production. 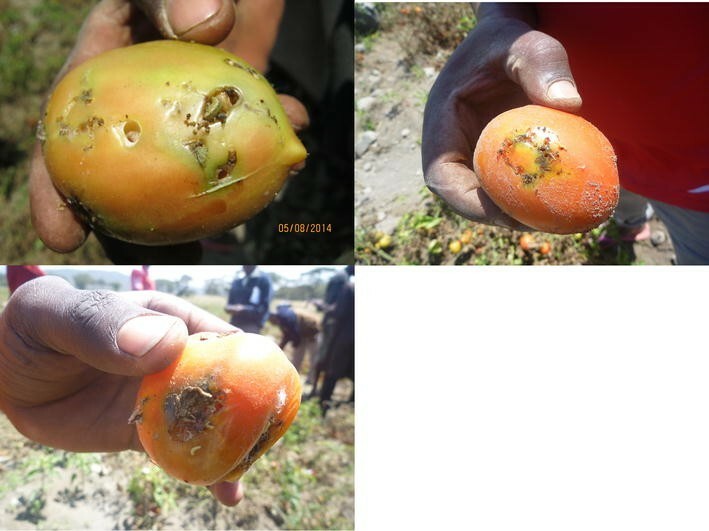 Such a phenomenon occurred in Ngabobo village, Ngarenanyuki, King’ori, in the Arumeru District of Tanzania, a key tomato production area, when boring Lepidoptera larvae were found on aerial parts of tomato (Solanum lycopersicum L.) plants between 2014 and 2015. Larvae created blotched leaf galleries and superficial mines on fruits. The pest was identified as Tuta absoluta (Meyrick 1917) (Lepidoptera: Gelechiidae) by the leaf and fruit damage symptoms inflicted, the adult morphology as well as using specific pheromone traps (TUA optima lure) against adult male Tuta absoluta. This is the first record of tomato leaf miner Tuta absoluta (Meyrick 1917) (Lepidoptera: Gelechiidae) in Tanzania worth to report. This information will help to design sustainable management tactics against this notorious pest of tomato in the country and the neighbouring countries of sub-Saharan Africa. In Tanzania, tomato (Solanum lycopersicum L.) is one of the most important edible and nutritious vegetable crop and sources of income . Tomato is produced by small and medium growers for food and household income. Tomato yield in Tanzania is estimated at 17.5 Mt/ha. Currently yield production has dropped to 50 % of the total production due to various constraints including pests and diseases . The tomato leaf miner Tuta absoluta (Meyrick) (Lepidoptera: Gelechiidae) is one of the most serious pests of tomato (Solanum lycopersicum L.; Solanales: Solanaceae) but is also known to attack cultivated solanaceous plants such as eggplant (Solanum melongena L.; Solanaceae), potato (Solanum tuberosum L.; Solanaceae), pepper (Capsicum annuum L.; Solanaceae), tobacco (Nicotiana tabacum L.; Solanaceae), solanaceous weeds and garden bean (Phaseolus vulgaris L.; Fabales: Fabaceae) . It is a native pest of South America but has spread to Africa, Asia and Central America. Since its introduction to Spain in 2006, it has invaded most of the countries in Europe, Mediterranean, Middle East, northern, western and eastern Africa and India in South Asia [3, 4]. In northern Africa, it was reported in Tunisia in 2008 , north of the Sahel in 2008 , western Africa in 2010 and Sudan and Ethiopia in 2011 . In these countries, it causes 80–100 % crop loss when proper management technologies are not implemented . The pest can produce between 10 and 12 generations a year, and each female can lay 250–300 eggs in her lifetime [2, 4]. There are four (4) larval instars; the first two (2) instars mine the leaves by feeding on the mesophyll and leaving the epidermis intact, thus creating tunnels on the leaf commonly known as “mines”. These mines reduce the photosynthetic surface of the leaves and result in early drying and eventual death of the plant. Later the third and fourth instar larvae leave the mines and bore into stalks, apical buds and fruits. Pupation takes place in the mines, in dried leaves or in soil . 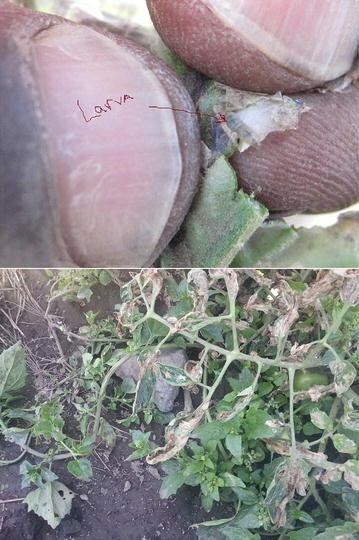 The devastating effect of the insect pest on tomatoes in Ngabobo village, Ngarenanyuki ward (3°24′38.9″ S and 36°39′37.1″) (Fig. 1), King’ori division, was first noted in August 2014 by the Arumeru District Officials. They brought to the attention of Tropical Pesticides Research Institute (TPRI) the problem of an unknown insect pest destroying tomatoes. Subsequently, a reconnaissance tour and sampling commenced on 5 August 2014 by a team of 15 people from research stations and universities. 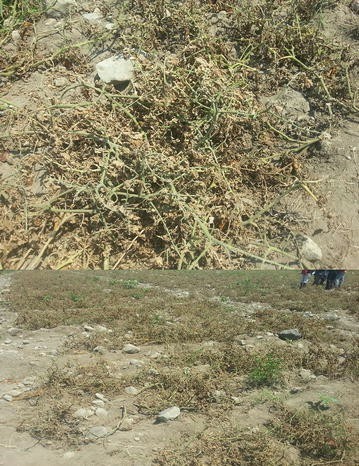 Nine (9) tomato fields were surveyed based on the damage symptoms as directed by village agricultural extension office. In a cross-sectional pattern, 100 plants were examined in each field, and per cent damages were determined by counting number of damaged plants against the undamaged ones. Thus, % plant damages = No. of damaged plants × 100/total no. of plants examined. These data were analysed using MS Excel software to determine the means per cent damages in each field surveyed. The larval infested tomato fruits, leaves and other infested plant debris were collected and transported to the National Insect collection Reference Centre (NIRC) situated at TPRI. The infested leaves and tomato fruits were dissected to obtain different larval instars for identification. Furthermore, the larval infested tomato fruits, leaves and other plant debris were incubated in the cage (Fig. 2) until when they grew into adult moths. With the aid of stereomicroscope, the fruit damages had characteristic holes in the surface, leave’s mesophyll tissues were mined between the upper and lower epidermis, the larva from the dissected tomatoes and leaves was creamy-white in the early instars and green or pinkish with dark brown head in later instars. The adults obtained from the rearing cage were quite small, less than 7 mm in length, and they had grey to brown scales and black spots on anterior wings and filiform antennae (bead like antennae). 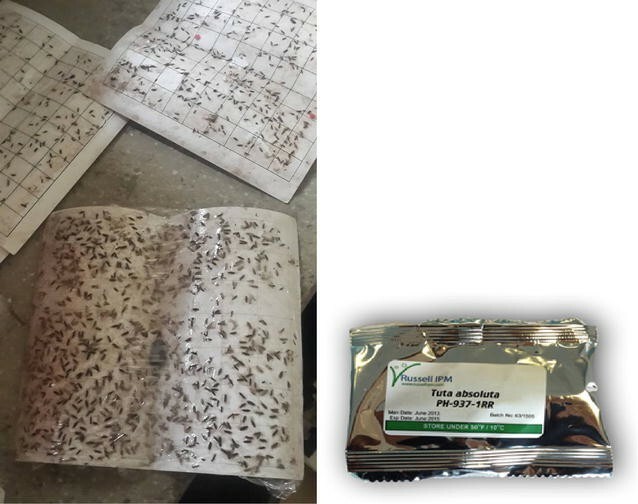 Voucher specimens were retained in the National Insect collection Reference Centre (NIRC) for future reference, while photographs of adult moths, larva and the damaged fruits and leaves as observed under the microscope were sent to Russell IPM for confirmation. Furthermore, Russell IPM brought Tuta absoluta specific pheromone traps (TUA optima rule) to catch adults male moth (Fig. 3). On 27 July 2015, Prof. Muniappan Rangswamy of Virginia Tech. IPM Innovation Lab confirmed the identity when he personally visited TPRI laboratory during Tuta absoluta workshop sponsored by USAID held at TPRI Headquarters, Arusha, Tanzania. In the survey, it was observed that the mean plant damage inflicted by the pest in all tomato fields was scored to be between 90 and 100 % (Fig. 4). This is the highest loss for tomato growers who have ever experienced (village extension officer verbal communication). The larva mines the leaves (Figs. 5, 6) producing large galleries and later burrows into fruits. 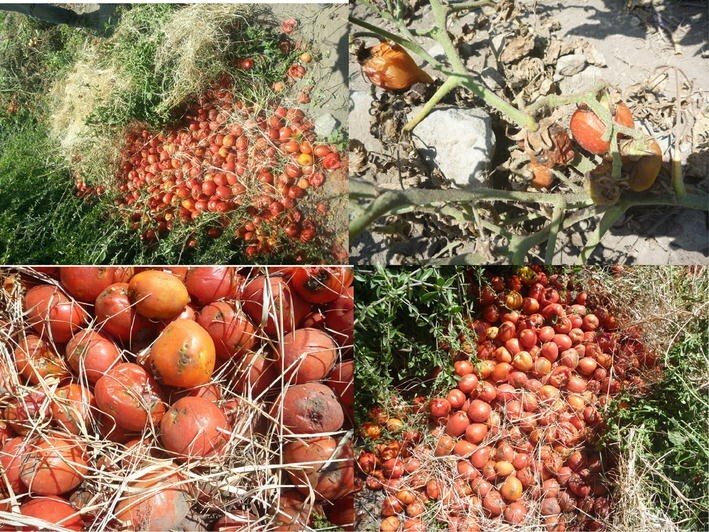 The pest did not concern till June 2014 when growers started suffering enormous tomato losses (Fig. 6) resulting in economic loss irrespective of high pesticide use. As reported in Senegal  and in Bulgaria , the plant damage symptoms, larva and adult morphological features observed under the microscope are typical of South American tomato leaf miner (Insecta; Lepidoptera: Gelechiidae; Tuta absoluta, Meyrick 1917). The presence of South American leaf miner Tuta absoluta (Meyrick 1917) (Lepidoptera: Gelechiidae) in Tanzania poses threat to tomato growers in terms of cost of production. It is imperative important to report the presence of this pest in the country because knowledge of what pests are present in a crop is an important step in devising appropriate management approaches. From this paper, the following recommendations are put forward; research institutions need to collaborate with other local or international organizations such as Russell IPM and IPM IL to develop and train growers and extension officers in environmentally friendly management strategies against the pest including the possibility of recruiting local natural enemies or importation of the same. Local and regional system establishment of pest invasion alert will also be of paramount important so that farmers are not taken by surprise when a new pest invades their crop with such a loss of their production. This publication should save as a basis for understanding the presence of this invasive alien tomato leaf minor Tuta absoluta (Meyrick) (Lepidoptera: Gelechiidae) in Tanzania. MC was involved in field survey, data collection and laboratory rearing and initial identification of the pest and the write up of the manuscript. SA, NH and AJ were involved in setting of optima rule traps for adult male collection, laboratory and field identification, and final write up of this manuscript. SM and EK were involved in field survey, data collection and final write up of the manuscript. All authors read and approved the manuscript. Authors would like to acknowledge TPRI Administration for infrastructure and moral support. Many thanks are extended to Russell IPM Ltd for their technical support in the whole process of pest identification and writing the manuscript. We are expressing our gratitude to IPM IL Director, Muniappan Rangswamy, for confirming the pest identity as Tuta absoluta during the Scientific Workshop at TPRI in 2015. Last but not least, we acknowledge the financial support by USAID for the workshop. Maneno Chidege is a plant entomologist and a head of Post Harvest and Entomology section. Dr. Shakil Al-zaidi is a scientist and a director for Russell IPM, Dr. Nayem Hassan is a head of Research and Development for Russell IPM, and Dr. Abisgold Julie is a Programme Coordinator-Africa for Russell IPM. Sheila Mrogoro and Elialilia Kaaya are agricultural extension officers for Arumeru District Council-Arusha. Not applicable as the research involved damaged tomato plants only.